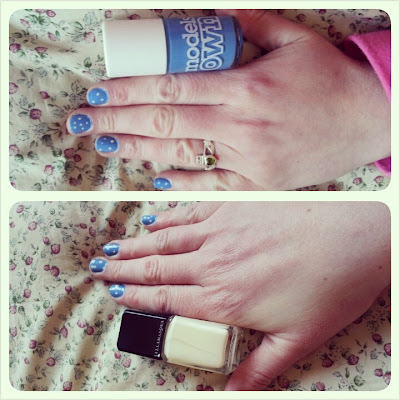 This week I went with a bit of class blue and cream polka dot! I used Models Own Feeling Blue as the base colour and Illamasqua’s nail polish in Load for the polka dots. This is the first Models Own polish I’ve used and I’m not overly impressed. It was a bit thick and gloupy of itself, which made it a bit of a pain to apply. The second coat applied a bit better but I’m still not overly fussed. It also takes a bit to dry, which is frustrating. The pigmentation isn’t bad, but two coats are definitely needed. The Illamasqua polish had great pigmentation, so I only needed to do the dots once! I generally enjoy using Illamasqua polishes, they don’t necessarily last too long. This manicure lasted for about 4 days before I took it off, it did chip after the first day – probably because of the thickness of the Models Own polish, two coats of Models Own polish and you have a thick layer of polish. Which is a shame because I really liked this manicure. It’s the first time I’ve done polka dots to a half decent standard! I used an essie base coat to strengthen my nails and a BarryM top coat.